SEOUL, Nov. 6 (Yonhap) — The Koreas and the U.S.-led U.N. Command (UNC) agreed Tuesday to draw up joint “rules of interaction” governing their guard duty in a disarmed Joint Security Area (JSA) in the Demilitarized Zone, Seoul’s defense ministry said. The agreement came at the third round of their trilateral talks at the Freedom House, a South Korea-controlled building in the border truce village of Panmunjom. The three sides discussed a set of follow-up issues related to the JSA disarmament, including the verification work that occurred on Oct. 26 and 27 after the Koreas removed guard posts, armed troops and other weapons in the JSA following the demining operations there. “(The three sides) agreed to draft the rules of interaction that will be applied to guard duty in the JSA and decided to make a decision on them at an early date through exchanges of documents,” the ministry said in a press release. At the talks, they also discussed how their surveillance equipment is run and ways to readjust its operations. Once the disarmament and related procedures are complete this year, Koreans and foreign tourists will be allowed to cross the Military Demarcation Line from 9 a.m. to 5 p.m. The South and North will each station a patrol of 35 unarmed soldiers there. The South and the North were represented by Army Col. Cho Yong-geun and Army Col. Om Chang-nam, respectively, at the talks. The UNC’s delegation was headed by Army Col. Burke Hamilton. 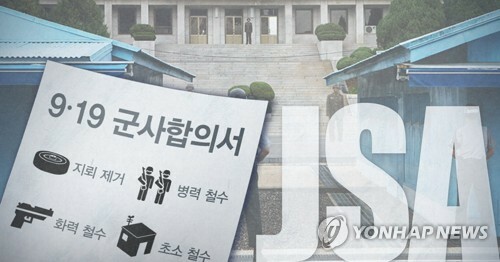 The Koreas agreed to disarm the JSA under the military agreement their countries’ defense chiefs signed during the third summit between President Moon Jae-in and the North Korean leader Kim Jong-un in Pyongyang in September. The UNC oversees activities inside the DMZ.